This new volume contains an updated chronology of global conflicts associated with water, as well as brief reviews of issues regarding desalination, the Salton Sea, and the Three Gorges Dam. 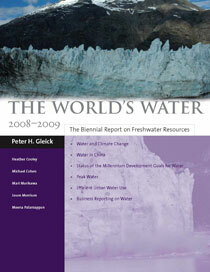 From the world’s leading authority on water issues, The World’s Water is the most comprehensive and up-to-date source of information and analysis on freshwater resources and the political, economic, scientific, and technological issues associated with them. It is an essential reference for water resource professionals in government agencies and nongovernmental organizations, researchers, students, and anyone concerned with water and its use.